Clay minerals are a major component of most soils. They are layer silicates typically formed by weathering of other silicate minerals. Clays have a large surface area and can hold an electrical charge – usually a negative charge that attracts and holds positively charged ions from nutrients. This cation exchange capacity (CEC) has an effect on soil structure stability, nutrient availability, soil pH and soil reaction to fertilizers and other additives. In addition, various clays have the ability to attract water molecules and swell which can impact soil drainage. With the PSR+ high resolution field spectroradiometer and EZ-ID mineral identification software a researcher can identify and analyze the clay properties of soil in the field or lab for a more accurate assessment of soil characteristics. Some of the most common clays are kaolinite, smectite, and illite. Soils with a higher clay content tend to have a moderate to high CEC and possess a greater capacity to retain nutrients against leaching. High CEC soils have a higher water holding capacity and greater capacity to resist changes to soil pH. Soils with more kaolinite and illite tend to be less fertile than soils with a higher smectite content. 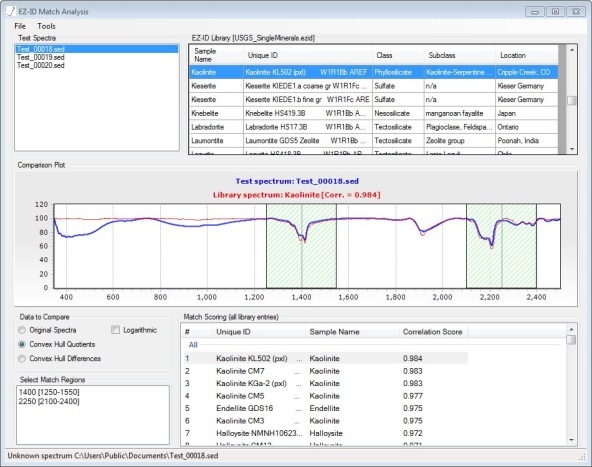 The PSR+ running EZ-ID software with the USGS and optional SPECMin and GeoSPEC spectral libraries can help identify different clay minerals in soil samples. The PSR+ collects high resolution/low noise scans that can be analyzed and matched against known samples in the EZ-ID libraries by measuring and matching major absorption features. For clays like illite, kaolinite and smectite (montorillonite), absorptions near 2200 nm are due to combination vibrations and overtones of Al-OH, H2O, OH and CO3. For kaolinite the absorption doublet at 1400nm is due to overtones. An O-H stretch combination and an Al-OH bend are shown near 2200nm. Smectite, a group that includes Montmorillonite, has strong characteristics with absorptions at 1400, 1900 and 2200nm. Smectite has an octahedral layer causing the first overtone of a structural O-H stretching that appears at the 1400nm band. Bound water in the lattices of Smectite will show bands at 1400 and 1900nm due to vibrations. The combination bands that are caused by vibrations of bound water come about at somewhat shorter wavelengths at 1400 and 1900nm. Smectite and Illite can sometimes show very similar absorptions if one does not know what to look for. Illite shows absorptions at 1400, 1900 and 2200nm just like Smectite. Illite can be distinguished from Smectite by having additional absorptions at 2340 and 2445nm. Soil analysis using a PSR+ full range UV/VIS/NIR spectroradiometer with a 350-2500nm spectral range is fast, non-destructive, affordable, and doesn’t involve hazardous chemicals. With our handheld sample contact probe, soil spectra can be collected in the field from outcrops or a soil pit. 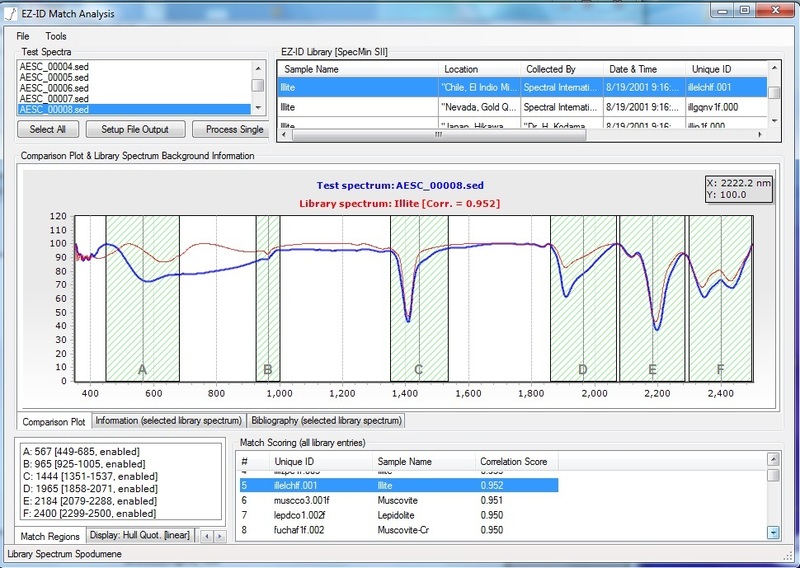 EZ-ID provides a best match based on examining the target spectra and the library spectras. 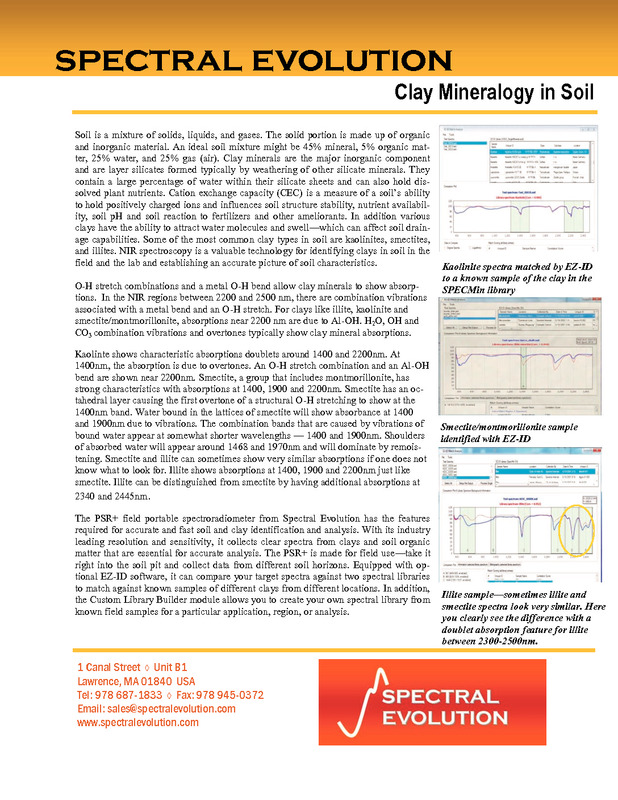 A researcher can add or remove regions of interest to focus on only the prominent features in the spectra for a better identification in clay mixtures. The PSR + can be combined with a wide range of accessories including a range of FOV options such as direct attaching 4°, 8°, or 14° lenses, 25° fiber optic, diffuser, or integrating sphere. Fiber mount options include 1, 2, 3, 4, 5, 8, and 10° lenses. It can be used with a sample contact probe, leaf clip, or benchtop probe with sample compactor and can store 1,000 spectra on the instrument without a computer. Communications interfaces include USB and Class 1 Bluetooth. Kaolinite spectra identified using EZ-ID software. Scan taken in a soil pit in Wisconsin. Illite sample – sometimes spectra of illite and smectite look similar. Here you can see the difference with a distinctive doublet absorption feature between 2300-2500nm that doesn’t appear with smectite.